Gulshan Human Chain and Rally on Save Water ! Save Life! 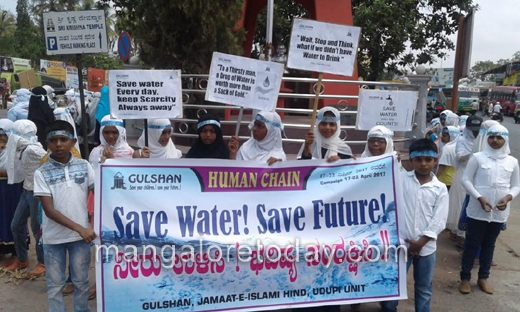 Udupi, Apr 20, 2017 : An attractive "Human chain and Rally" was formed around the clock tower near service bus stand, Udupi by 130 Children’s (ages 5 -15 years) of Gulshan under the Central theme SAVE WATER! SAVE LIFE!! Gulshan is the children wing of Jamaat-e-Islami Hind. Gulshan is organizing a "SAVE WATER! SAVE LIFE!! campaign, from 17th to 22nd April 2017. The campaign was launched on 17th April, and various activities like Summer camp, Mohalla visit, drawing, mono acting, elocution, chart making, short clip, model making competitions, public programs are organized during this campaign. 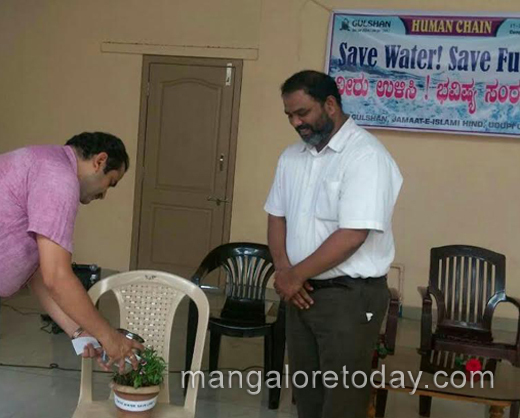 Human chain and Rally was inaugurated by watering a plant from the hands of the chief guest Mr. Sooraj Bhatt (Education Coordinator, Department of Education, Udupi Taluq) and Dr. Abdul Azeez (MUFIILIPE, Manipal University). After the Inaugural ceremony, Children’s formed a human chain at the clock tower in Service bus stand of Udupi and created awareness among the public about the importance of saving water, rain water harvesting, fair usage of water. Miss Navida Husain Asadi has organized the Human chain along with Mrs. Meharunisa (Convener, Gulshan Festival), Mrs. Sahida Riyaz (Ladies wing organizer, Jamaat-e-Islami Hind, Udupi), Mr. Nisar Ahmed (Secretary, Jamaat-e-Islami Hind, Udupi), and Ms. Sadhika (President, Girls Islamic Organization, Udupi) Sadhika.